on construction − hermetic, semi-hermetic and open. 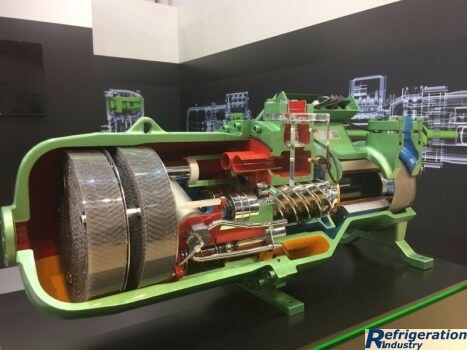 Increased requirements are always demanding to the refrigerating compressors: greater reliability, considerable life-time, high efficiency, etc. As in the air supply, used in refrigeration compressors, positive displacement (reciprocating, screw, plate) and Kinetic Energy (turbochargers, ejectors). A. Enclose compressors with ammonia and freon. These are vertical or angular (V- and W-shaped) devices in case of the monoblock compressor (for strengthening, rigidity and easiness of layout) of a single-action machine. Usually these are the direct-flow compressors, with false cylinder covers (to protect against the water-hammer effect). Cylinders are cooled. The ammonia compressors have a jacket cooling by water. The freon compressors are air cooled, with fins of the cylinders. irreplaceable for the small production. complex access to the bearings, the lubrication system and other details, located in the block-crankcase. B. Open-crankcase compressors with the horizontal opposed cylinders arrangement. These are double-action machines with the increased productivity, one- and two-staged, with a mutually opposite movement of the pistons. They are constructed to work on ammonia, propane, propylene. Cooling − water. Disadvantages: sensitivity to water hammering. Machines of this type are successfully replaced by the screw compressors. 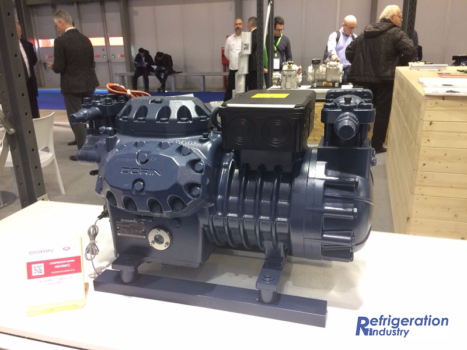 Screw compressors are widely used in the refrigeration machines. These are one-or two-rotor machines of volume effect with a constant geometric degree of compression. They are divided into two types: dry and oil-filled. A large amount of oil is injected into the working cavity to seal the gaps, lubrication and cooling into the oiled compressors. The oil injection allows reducing the noise level significantly. easy servicing, automation and remote control. necessity for cooling at medium and high degrees of the increased pressure. The cooling capacity of screw compressors is regulated by the movement of the slide, which is moved along the rotor’s axis. Moving it in the direction of exhaust side, a working length of the screw decreases and, accordingly, the productivity is. When starting, the compressor is completely unloaded. ​having a reduced noise level. At the same time, it should be noted that an increasing number of spiral compressors are being offered on the market today, with a constant increase in their quality. It is expected that in the near future this type of equipment will begin to displace the other less reliable systems. This, as a rule, is centrifugal compressors with a volumetric capacity of 50-60 m/min or more. They are used for large refrigerating plants and cooling stations. The number of sections is 2-3, steps from 3 to 7, with branch pipes between sections for the interstage refrigeration and staged throttling. To regulate the compressor capacity, input regulating (guiding) apparatus (IRA or IGA) is used. By swirling the flow in the inlet at the impeller, the capacity can be varied from 100% to 50% of the rated value. These are the high-speed machines (≤13000-15000 rpm); therefore, when using an electric drive, reducers are necessary. The advantages and disadvantages of refrigeration turbochargers are the same as those of air superchargers of this type. 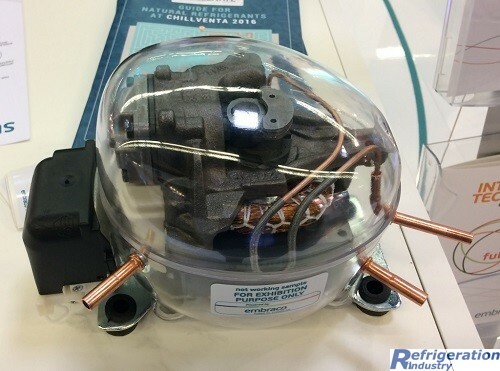 Refrigeration compressors differ in their construction for the hermetic, semi-hermetic and open devices. 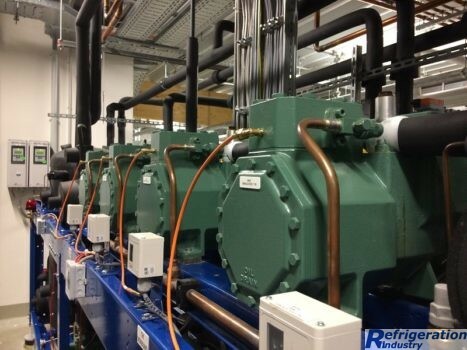 Hermetic refrigeration compressors have a relatively small capacity - up to 35 kW. 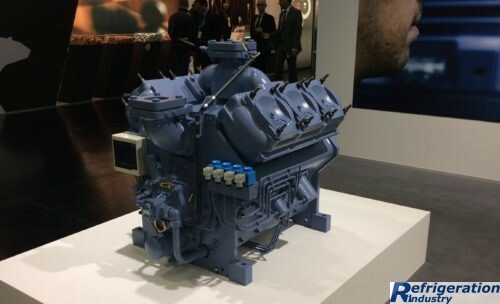 Semi-hermetic compressors are used in the units, where the large-capacity compact equipment is required. This type of equipment can develop the power up to 350 kW. 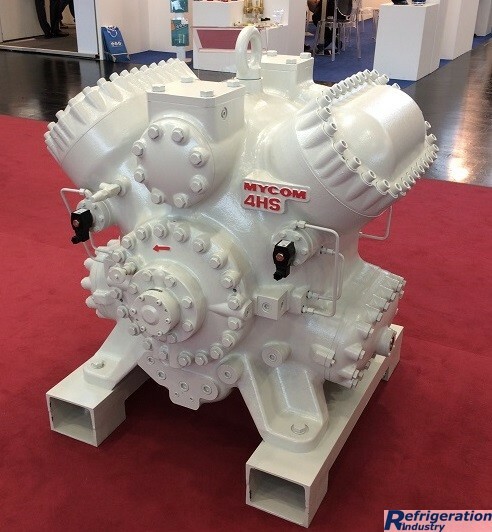 Most often there are piston and screw models of compressors. The working part and the electric motor of this device of this type are in a dismountable casing, which makes the compressor more repairable. It can be easy dismantled, remove the electric motor and replace the necessary parts. The operating mode can be adjusted by closing a part of the suction valves. The main feature of an open compressor is the presence of an external motor. This is a rather cumbersome construction, but has many advantages. Most often, open compressors are used in large industrial plants, where they are most effective. The shaft driving the compressor mechanics goes beyond it, so it requires a special seal. Typically, an oil seal or rotary seal is used. 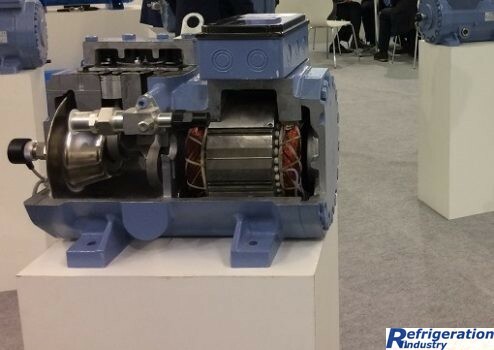 The compressor can rotate at the engine speed or, with the transmission (most often a wedge-belt), its rotation speed can be increased by selecting a sheave of the desired diameter. ​convenient adjustment of the operating mode by means of inverters. Find supplier company or brand of refrigeration equipment on our online directory.